The Lean BOS® Assessment helps identify breakdowns in business planning, business processes, and business operations that impact customers by creating unnecessary costs. Such breakdowns may include non-value-added steps, unnecessary bureaucracy, poor communication, process inconsistencies, and process confusion. These costly problems can only be resolved if they are objectively identified, clearly defined, and subsequently quantified and fixed. The Lean BOS® Assessment provides a powerful tool for senior management teams to help identify areas for improvement. The Lean BOS® Assessment can be compared to a report card. It provides a baseline or "stake in the ground" so that the grade can be improved quickly. When Pinnacle Enterprise Group (Pinnacle) conducts the Lean BOS® Assessment it provides a consistent approach to the scoring and the most unbiased score on which to base future resource allocations. The key is having a thorough knowledge of Lean BOS® practices and processes. Contact Pinnacle to schedule your Lean BOS® Assessment. "You can't manage what you don't measure, and you can't succeed if you don't manage," sums up the necessity to measure the right things in the right way. Measuring Lean BOS® practices generally means measuring what others ignore and ignoring what others measure. For example, it makes no sense for production or front office to evaluate processes using financial measures, such as systems of variance, ROI, labor reporting, and absorption. Operational Excellence - QMS Platform, 5S, Quality Process, Work Cells/Areas as Profit Centers, Visual Controls, Standard Work, Total Productive Maintenance. Just-In-Time - Continuous Flow, Pull Systems, Leveling, Quick Changeovers. People - Continuous Improvement, Training, Supplier/Customer Alliances. Lean BOS® Assessment can be completed for an entire facility, a focused factory, or a specific area or value stream within the organization. What To Expect From the Assessment? Four results come from a detailed Lean BOS® Assessment. You will gain a clear understanding of what needs to be improved or corrected. You will gain a snapshot view (baseline) of current conditions that can be compared and monitored during the implementation of Lean BOS®. You will have the ability to prioritize Lean BOS® issues and provide for a plan on which to base future resource commitment. You will have a Lean BOS® direction upon which to continually reduce costs. Each phase involves a variety of tasks, information, and forms. An information section that includes a definition of the Lean BOS® building block, a detailed description of assessment guidelines and a list of tips for becoming world class with a 4.0 score. A scoring table with a summary of the guidelines, a scoring chart, and an area to write comments or suggestions. The scoring table uses a 0-4 point range to allocate a score for each guideline. Pinnacle will complete the scoring tables for each Lean BOS® building block by determining the number of points (0-4) for each guideline that best describes the Lean BOS® practices being assessed. When each guideline has a 0-4 point score recorded, the average points for each Lean BOS® building block are computed and recorded. Additional comments and suggestions are also provided. 100% of the Lean BOS® building blocks being assessed may include, when appropriate, the front office and all key administrative procedures. Under Comments/Suggestions, parameters that are unique to your operations are defined so they are documented when a follow-up assessment is completed. There are three basic steps to this part of the Lean BOS® Assessment. Plot scores on a radar chart - Once the scoring tables are completed, the average number of points for each Lean BOS® building block is plotted on a Radar Chart, which provides a visual image of how well a facility compares to world class performance measures, or to previously established benchmarks. 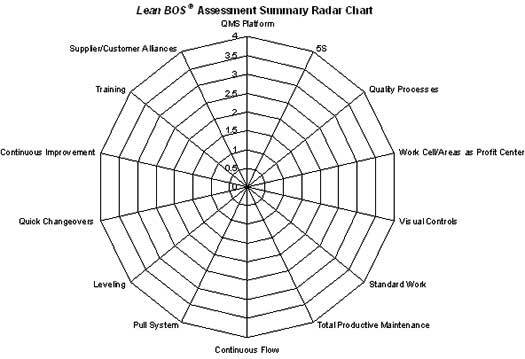 Complete a Summary Form - When the Radar Chart is completed, a total assessment score for the organization is computed on the Lean BOS® Assessment Summary. Compare to World Class - A five-level rating scale (0.0 to 4.0) provides a Lean ranking for your total organization and compares your score to a world class rating scale. If you completed a previous assessment, you will have your previous score as a benchmark. Results are being achieved at all levels. But, since the competition is not stagnant, there is a need to drive continuous improvement efforts. Lean is now becoming the company culture and world-class performance is in sight. There is a need to leverage momentum to reduce the risk of sliding back into old habits. Accelerating a Lean focus will drive change. Adoption and commitment are necessary to remain competitive and stay in business! Contact Pinnacle to schedule your Lean BOS ® Assessment.